The summer season is one that is usually filled with laughter and excitement as well as time spent outside with your family and friends. However, it's also a time of the year when bees and wasps tend to swarm around more than at any other time of the year. There are a few things that you can keep in mind while you're outside to decrease your chance of being stung and to keep other people from being stung as well. Keep containers outside to a minimum. You should also keep water out of containers that you do keep outside because some bees and wasps tend to make their nests close to a water source. If you see any kind of wasp nest, knock it down before the insect begins to build it to a larger size. Once the larva has been laid and there are wasps swarming around the nest, it can be unsafe to try to get it down on your own. 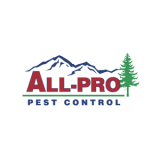 All-Pro Pest Company can use products safe for the environment to treat any nests that are around the home or in the yard so that you don't risk getting stung. A wasp will usually be more aggressive than a bee. Bees are typically satisfied to get food from flowers and go on their way. However, wasps are sometimes territorial and can defend against any nest that is made. Most wasps won't begin to swarm until the middle of June. Bees will begin swarming in April or May when the flowers and trees begin to bloom. The queen wasp will begin looking for a place to make a nest when the weather gets warmer, so monitor outside corners of the home as well as places that provide shelter, such as underneath a porch or inside a flower pot. When you begin seeing a large number of wasps or bees swarming, contact All-Pro Pest Control because it can mean that a nest of a significant size has been built. If you come in contact with a wasp or a bee, be aware that a wasp will sometimes continue stinging until it's killed or swatted away whereas a bee will often stop stinging because the stinger breaks off. Don't let your summer fun in Kent, Washington be ruined by pesky pests. Check out our service area and see if we can come to your house or business and help alleviate your pest issues.